A very popular in Japan Netsuke figurines, as a work of applied art and selling figurines of this kind are now quite active. In ancient times, been popular totem, the so-called figures of animals or natural phenomena. 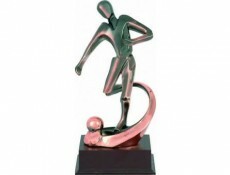 Now very popular plastic figurines and statuettes made ​​of metal, which shows a variety of sports or the arts. Thus, it is easy to pick up statuettes for people of different occupations, hobbies and professions. The greatest variety of figurines in the class of sports, here you can find different varieties of them, according to the sport. No less extensive is the class, on statuettes of animals, among which we can find, so to speak classical statues of dogs, and more rare, for example, pigs. The sale of statuettes now is active enough. Very popular figurines of statuette Netcke in Japan, as work of the decoratively-applied art. Totems, so-called figurines of the animal or natural phenomena, were popular in ancient times. Plastic statuettes and statuettes metallic are very popular now, where the different types of sport or art are represented. The statuette of Nik, for example, was created once by a sculptor by Sergey Mikulski, but a statuette then was not known under this name. The name is Nik appeared only then, when tried the great number of variants, by the way, one of the names sounded as "Wings of Advices", well, that this name fell off. For us you can buy statuettes, not adding the special efforts in a choice. Also on an order, we can make statuettes from a metal fully. No less popular is the Oscar statuette, it can also be a number of universal prichest statuettes. Sale of figurines is one of the main directions of our company. With a wide range, to date, we have, we can buy a figurine for any occasion, whether it be sports, music, dance, drama and other competitions. Also on order, we can make figurines of metal on an individual layout, taking into account the different requirements.